Good Earth’s beach-hair-don’t-care-hot-cousin, Nicobar does easy breezy apparel rather well, but what it also does is home decor, especially their gorgeous smelling soy candles. For one, the store smells amazing. Naturally, on entering, my first question was — ‘Where’s this coming from?’ Though the answer was an oil-diffuser at the store, my attention and nose were redirected to a stack of soy-wax candles perched on a shelf. They’ve got a few scents to choose from, my favourites being Casablanca and Madurai, both of which made it straight to the purchase counter. I haven’t been to either Casablanca or Madurai, but the scents of these two candles are just lovely. Madurai’s got the scent of mogra locked down and Casablanca oozes the fragrance of grapefruit and neroli. 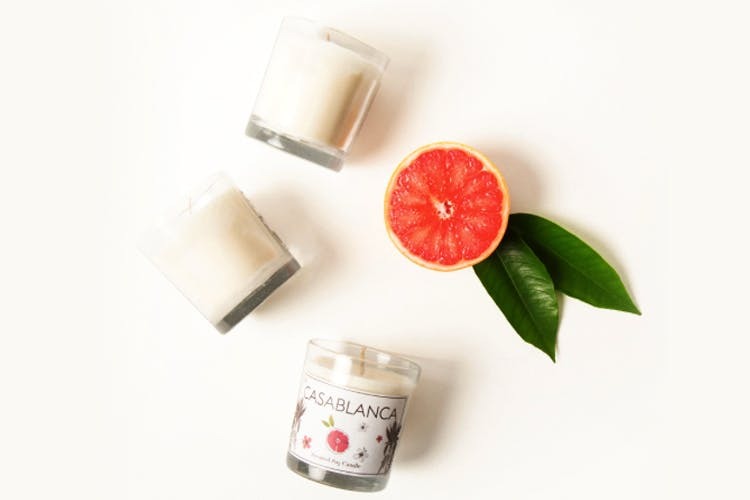 I’ve been using Niana and Diptique candles for a while, and it’s good to know there’s another awesome option to choose from. You’ll find clothes, cutlery, mugs in awesome prints, travel bags, and home décor accents. Everything’s white, grey, neon, indigo, with pops of colours and prints splattered here and there. The colour palate is totally up my alley, and I’ve bought their mugs as gifts for friends in the past. PS: Soy Wax candles last longer, and don’t give out that weird burnt smell that comes out of regular scented candles.